Good old Scruffy Murphys. Anyone who has had the pleasure of visiting the inconspicuous Birmingham venue in the last few years is very likely to have seen an amazing band or two on that small little stage, tucked awkwardly away at the end of the bar. Say what you want about the pub itself – it’s certainly of the dingy rock pub variety (just the way we like them) – but the sound is fantastic, the dedicated group of gig-goers are friendly, and the promoters there have a way of putting together interesting, often contrasting line-ups. And it was on one such night that I first encountered Birmingham’s own Moghul. Opening the bill, what struck me first and foremost was the thought that this band, established in 2012, come incredibly fully-formed. 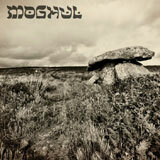 While they worship at very much the same altar as bands like Conan, where the Mass is comprised of monolithic riffs, tone reverence is the gospel, and psalms are delivered in distant shrieks and blood-curdling growls, Moghul aren’t content to be imitators, bringing their own diverse set of tastes with them to deliver their own fresh take on doom. The guitars are dense and impenetrable, the drums powerful and driving and the vocals perfectly balanced between harmony and discord. However they also make excellent use of being a two-guitar band experimenting with textured lead guitar parts that elevate them beyond simple down-tuned rutting. On both tracks, the band weave an intoxicating psychedelic element into the formula, often inflecting Neanderthal riffs with lysergic guitar leads to create woozy, discomforting atmospheres. “Dead Empires” is comprised of a simply gnarly riff, snaking and shifting effortlessly into variations of itself to propel the song along, augmented by the aforementioned layers of lead guitar which give both tracks an expansive feel that contrasts nicely with the often-claustrophobic onslaught. “Hidden Hand”, the longer of the two tracks, is a slightly more meandering affair altogether but it’s just as bone-crushingly heavy, and must come pretty close to tickling the brown note in its final, devastating moments. The production and mixing on both songs are also fantastic – each element is clearly distinguishable from the next without ever compromising on the heavy. For a debut release, Dead Empires is amazingly assured stuff and, being only two-tracks long, hopefully indicates that there is plenty more where this came from. With a host of excellent bands springing forth into existence in the past few years, Moghul can definitely stand up and be counted as one of the most exciting UK bands to come along in some time and Dead Empires is as strong an opening gambit as a new band could hope to offer.